It was far closer than it should have been. The modern submarine was a development of the boats invented by John Phillip Holland around the turn of the last century. The submarine had been around as a weapon for about 100 years more or less effectively before Holland, but due to the limitation placed upon them by the lack of a propulsion system that would work underwater the boats were at best limited and essentially useless. Holland first started with compressed air as a propulsion, but soon switched to batteries as lead acid battery technology improved. Around the turn of the last century Holland managed to produce boats that actually worked fairly well and were not as suicidal for their crews as they were dangerous to an enemy. Holland built boats for the US Navy and many others, including the German Navy, but these were for the most part considered experiments and technology demonstrators rather than practical weapons of war. Due to a Holland’s small size and short range they were considered as suitable as harbor defense adjuncts as much of anything. Here are some early war German boats. Pictures from this Reddit post. The way in which the boats were growing out of their coastal defense role is obvious. At the start of the war the Kreigsmarine, fully aware of it’s smaller size and capability of the High Seas fleet began to see the U boat as an equalizer, being able to sink British warhips until a more favorable ratio between the two fleets would exist. That would be a futile hope as the Grand Fleet would stay in anchorage while the blockade would be maintained by elderly cruisers, destroyers and patrol trawlers. The admiralty did not see the Grand Fleet as an offensive tool when they British Navy already had dominance of the North Sea and Atlantic. It would be up to the Kreigsmarine to take that dominance away and the Royal navy was not going to make that easy by parading the Grand Fleet through mine and submarine infested waters to be sunk willy nilly. In 1914 and 1915 the Royal Navy’s main actions were chasing down the scattered surface raiders and trying with not much success to deal with Uboats that were more frequently attacking the merchant ships as traveled alone across the Atlantic. This video from war History Visualized explains how the war evolved and the how the Royal Navy’s failure to implement the convoy system almost cost Britain the war. This article from the US Naval War college mentioned in the video goes into greater detail. The problem with the way that the Royal Navy was trying to deal with the rising U boat threat was that it relied on inception and the ability to attack a U Boat. This was a natural extension of the way the Navy had traditionally done business and so the approach was perhaps understandable. But in dealing with a submarine, this approach had severe disadvantages. Because nobody had had to deal with submarines and the fact that submarines were, in the prewar period, primarily the province of junior officers, being commanded by lieutenant and ensigns, there were no senior officers who understood how the submarine actually worked in combat. The fact is that the intrepid junior officer who was successful in “sinking” a ship full of admirals in exercises was likely to reprimanded if not sent to some far away station to command water barge or floating drydock was a large incentive to not push the capabilities of the boats. Probably with the boat with them so that the “accident” doesn’t happen again. There’s also the fact that most of the early effort was simply dealing with the teething issues of a new technology and keeping the boats running and afloat was a major accomplishment. So before the war there was no real work on ASW techniques and approaches. What little there was, was centered on protecting warships in harbor. When the war started, the Royal Navy treated the U Boat the same way that they did surface raiders, chasing after the ships radio communications and hoping that the patrols would spot the U boat and attack it. In the beginning there was not even a method of attacking a submerged boat even if the Navy knew where it was. It wasn’t until 1916 that depth charges were available and even then it was in pitiful quantities considering how many it takes to generate a hit. Most of the rest of the techniques were no better. Mine barrages along the U Boat exit channels had to be continuously replaced as British mines had a light attachment cables and tended to get blown away by storms and a mine has a limited useful life anyway, patrol ships cannot be everywhere at once and quite frequently were even unarmed and aircraft and blimps were too fragile in WW1 for the kind of long endurance patrols that ASW work requires. The idea of converting old and fairly useless ships into armed traps for U Boats, the Q ships was at least moderately successful at first as the idea was to make the ship a nice targe, but not enough to waste a valuable torpedo on and then open fire on the hapless sub coming in for the kill. The problem with that is that the Q ship has to run into the U Boat in the first place and it can’t be protected like a real warship. The problem with interception is that even a surfaced U Boat is almost invisible from any distance in any kind of seas. So unless you know exactly, as in 2000 yards or so, where the U Boat is, you will never find it with visual methods. A submerged boat using a periscope is visible at best 500 yards and it’s likely that the U Boat will see you coming, dive deep and evade long before you are on top of the boat. The Royal Navy invested enormous resources on the U Boat for little result, but steadfastly, for whatever reason refused to do the one thing that would have made the difference. They didn’t convoy the merchant fleet. Instead the Royal Navy invested ever larger amounts of resources on ever more patrols and laying ever more mines with almost nothing to show for it as the war went on. The fact is that Great Britain’s ability to fight and indeed survive rested not on it’s ability to deal with the U Boat, but on Germany’s ability to build sufficient numbers of boats and unwillingness to push hard on the threat of the US’s entering the war. The monthly totals show the story. As long as the Germans more or less abided by the prize rules Britain could get the cargos it needed to survive. When Germany went to unlimited submarine warfare, in six months Britain quite likely would have had to sue for peace if the Royal Navy had not implemented convoys. Apparently, with hindsight, the Royal Navy, with it’s offensive culture never considered that if intercepting a U Boat was almost impossible, finding a convoy in an ocean by the same visual means is also impossible. Especially if the convoy maintains radio silence. The fact is that a convoy moving perhaps three or four knots slower than a surfaced U Boat might as well be on the moon as far as the U Boat is concerned if it never comes with twenty miles of the boat and a convoy with a radio can receive U Boat location reports from the Admiralty and change course if necessary because even though radio direction finders(RDF) was not good enough for interception, it was plenty good enough to put a U Boat’s location within a 100 square miles or so and at 14 knots top speed a U Boat was never going to catch a convoy 100 miles away even it the U boat discovered the convoy’s existence in the first place. On the German side of the equation the U Boats got bigger and better as the war went on. Like a lot of the emerging technologies around the turn of the last century the submarine evolved very quickly as a result of the needs of the Great war. Here’s an album of pictures from a late war U Boat. This boat is a far different proposition than the dinky boats of 1914. This a boat that can handle long war patrols and span large areas of ocean. It can carry enough torpedoes to be effective as threat for a long period. The boat is equipped with the best technology that the German industry could provide in 1918 and it shows. The pictures also show just how technically sophisticated the crew had to be to run the boat. You could not keep this boat and all the technology inside running and effective without an educated and motivated crew disciplined enough to not make the kinds of mistakes that submarines are all to vulnerable to and willing endure living in a steel coffin on a war patrol that lasted weeks or months. Of course if the British had holes due to their culture so did the Germans. There was the desire to “play by the rules” and keep to the prize rules even long after it was obvious that there were no rules anymore. There was the concern about the US entering the war. There was also the long time it took to come to the realization that the Grand Fleet wasn’t going to parade around to get shot at by submarines while the country was under blockade. Of course the biggest problem was starting a war while being reliant on material that could be blockaded in the first place. Especially when that material included food. But then the Great War is full of stupidity like that. Here’s a bunch of U Boat Links that I found. This is an interesting video of U Boat preparing for patrol and on patrol sink a ship. I think it’s footage made for the following propaganda movie. 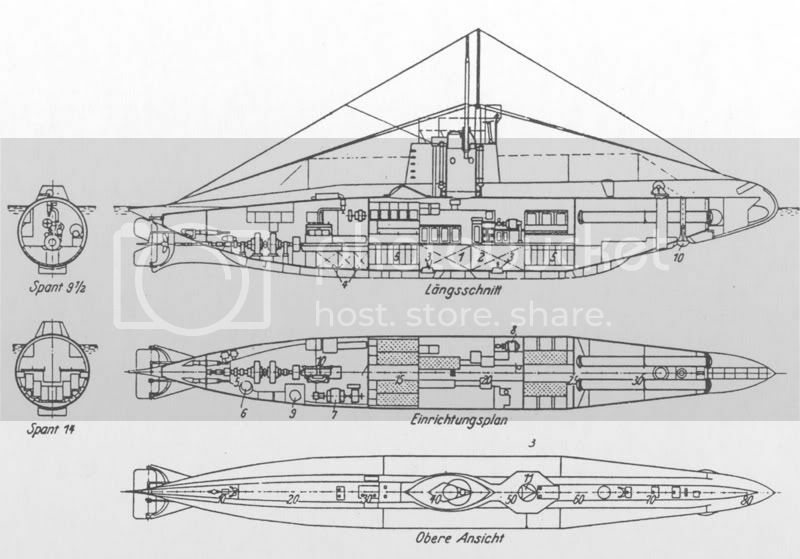 One of the strangest stories to come out of the Great War is that of the blockade runner submarine Deutschland. This was an unarmed sub that was sent to the US with a valuable cargo and sent back to Germany with urgently needed material like rubber and tungsten that were unavailable in Germany. I’ve never understood why the German government would allow the Deutschland to sail, potentially losing a large submarine for no return until I saw where it ported in the US. The boat ported in New London CT. If there is any place in the US or for that matter, probably the world where the implications of the performance of a submarine would be understood, It’s new London CT across the river from the Electric Boat shipyard, then and now. I can fairly say that a good portion of the people on the pier and probably toured the boat while it was docked, lived and breathed submarines as a part of their everyday work. The Deutschland was perhaps a not so subtle message to the US that the U Boat threat would not be limited to the European theatre if the US entered the war. Indeed, it was likely that the Deutschland did indeed return to the US coast as U cruiser later in the war after the US entered it. Like so many events in the Great War , victory or defeat rested not on the courage of the men fighting or the skills of the engineers, but on the pigheaded stupidity of the people in command and the ossification of those commanders as well as the willingness to expend enormous amounts of men and material for almost no return. The fact is that the victory of the Battle of The Atlantic was the result of brave men going around the high command than it was due to the actions of that command. The result of the actions by Admiralty were that the first U Boat war was far more of a disaster than it should have been, came far closer to actually losing the war and cost the lives of who knows how many merchant seamen than it should have. Which is typical of the Great War and all the participants.